MILWAUKEE _ Milwaukee-based artist Jan Serr and her husband, John Shannon, have committed $1 million to the University of Wisconsin-Milwaukee’s Peck School of the Arts for the creation and operation of a multidisciplinary arts studio on the sixth floor of the Kenilworth Square East building, located at Prospect and Kenilworth. The space, to be named the Jan Serr Studio (“Serr” is pronounced “Sair”), will be used for performances, screenings, exhibitions, filming and the development of projects by all five departments within the Peck School, and will serve as a resource for community arts organizations as well. 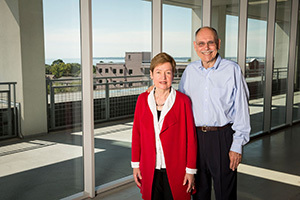 The couple’s gift will fund initial renovations to the top floor of the Kenilworth building, and construction is set to begin in 2017. The Peck School is seeking additional funds for a second phase, to include the installation of projection equipment, seating, theatre rigging and lighting, and dressing rooms. The gift by Serr and Shannon also will create an endowment to support future operations and programming in the Jan Serr Studio. Built in 1914 as a Ford Model T plant, the Kenilworth building was acquired by UWM in 1971 and redeveloped in 2006. In a first-of-its-kind partnership with a private developer, the university restored the first five floors for use by the students and faculty of the Peck School. This new educational facility, along with its street level retail space, has served as a catalyst to neighborhood development. UWM expects that creating the Jan Serr Studio will augment its arts programming and community impact. Scott Emmons, dean of the Peck School, expressed his gratitude for Serr and Shannon’s generosity. A 1966 graduate of UWM, Serr began her college career as a voice major and switched to visual arts after receiving encouragement from a UWM faculty member. She earned her MFA at UWM in 1968 and went on to teach art at UW-Stevens Point and Sheridan College Institute of Technology and Advanced Learning in Oakville (Toronto), Canada. Known for oil painting, monotype and photography, Serr had her first solo exhibition at the Marlborough Godard Galerie in Montreal in 1976. She received a Distinguished Alumnus Award in art and design from the UWM Alumni Association in 2010. John Shannon is founder and general partner of Caledonia Properties, with real estate developments in Milwaukee’s Menomonee Valley. He previously served as president and CEO of Quick Cable Corp., a manufacturer of electrical power storage equipment, with operations in the U.S. and Canada. He chairs the Peck School of the Arts campaign cabinet.